Feature, originally published 21st August 2008. 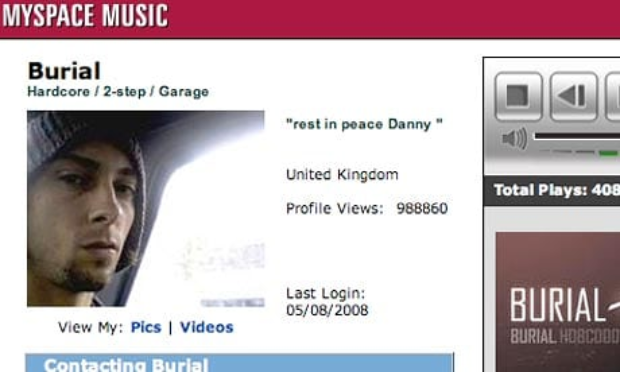 A few weeks ago a young British artist updated his MySpace blog and added a photo. No big deal I hear you cry and ordinarily you’d be quite right. But on this occasion the artist in question was the hitherto spectral figure at the pinnacle of South London’s underground dubstep scene, who up until then had preferred the blanket anonymity of being known only as Burial. And in finally revealing his real identity, this unassuming pioneer became national news. Since materialising in 2006 with a clutch of obscure but genre defining EP’s, Burial had – whether in a manner you may perceive to be contrived or not – successfully created a thriving cottage industry rooted in speculation surrounding his real identity. Shunning the mainstream press and remaining defiantly real, this locking within a burgeoning scene of which he rapidly became a leading progenitor heaped anticipation on his debut album – thrills on which it massively delivered. Rated by Metacritic as the second best critically acclaimed work of 2007 – ahead of In Rainbows, Neon Bible and Boxer – it was an intricate hybrid that managed to deftly blend the peculiar musique concrete inspiration of it’s urban roots. Startlingly evocative, the producer’s ability to convey both the apex of street paranoia and at the same time the nascent beauty of watery english dawns were unique qualities; for music created solely on a laptop, it was also a work bathed in an almost surrealist light. Immediately speculation became rife about who could’ve been capable of moulding dubstep’s largely nascent components into something so fully formed. For a long period of time Richard D James (AKA Aphex Twin) was the popular favourite, whilst wilder gossip threw Norman Cook’s name into the melee. Given that this is a movemement still largely rooted in the metropolitan districts of places like South London and Bristol but in terms of sales has displayed little capacity to tackle the mainstream, Burial’s comparative fame may have remained something of an obscure cause celebre for years to come. All this changed however in June of this year, when Burial’s second album Untrue received a nomination for the Mercury Prize, one of the most prestigious – and profile building – awards bestowed by the UK music industry. It’s also a gong with a history of controversy; since first being awarded to Primal Scream’s post baggy opus Screamadelica in 1992, the judges have not been shy of nominations and winners from the more avant garde fringes of musical performance. This willingness to confront popular taste reached it’s in 2005, when little known transgender chanteuse Anthony Hegarty stole away with the award with his album I Am A Bird Now. Whilst recently the victors have been from more mainstream indiedom – Arctic Monkeys, Klaxxons – the wise money is on the judge’s taste boomeranging out back into the eclectic hinterland of razor thin niches and word of mouth credibility. Sensing a story with all the clumsy drizzle of a noon-day dog, it was one of Britain’s pointless tabloid newspapers which triggered a sequence of events that led ultimately to that MySpace update. Declaring pompously that it was campaigning to prevent the ruination of the ceremony itself – in recent years all nominees have been required to perform – The Sun then set about sticking the twenty first century equivalent of a wanted poster out, designed to “unmask” the recalcitrant artist. The scenario itself was of course absurd – in reality, what better publicity for the show than an air of intrigue around one of the most enigmatic performers? It was a situation with little degree of choice; somewhat reluctantly, Burial revealed himself to be Will Bevan, the accompanying photo revealing an unassuming looking young man from the capital whom you might easily have sat next to on a Circle line train. That the moment proved to be anticlimactic had a degree of inevitability, after mysterious figures operate more on the periphery of our own romanticism, our imagination lionising them into vague notions of superherodom. The irony of course was that the paper’s desire was to subsume Bevan into the hoopla of celebrity guzzling Britain for profit was that the Independent had already run the story some two months before. Bevan certainly seemed tickety boo; “I’m a low key person, and I just want to make some tunes..nothing else” Whether this will be possible dependent on the result is open to conjecture. Or maybe Will Bevan is just another subterfuge, and perhaps he’s succeeded in pulling off the greatest trick of all, Keyser Soze like – convincing the world he doesn’t exist. The postscript here is also an obvious one – Untrue is now heavily favoured to win, feted beyond In Rainbows and also the underwhelming Alex Turner side project Last Shadow Puppets. Should it do so, it also genuinely signifies the end/beginning of an era; dubstep as a parent genre is almost unique in it’s isolationism, music made created in the early hours of the morning by the solitary light of a computer screen. Best consumed alone on an iPod and wandering through the corridors of the late night mind, it also maybe signifies the end of the form in terms of mass participation.